Let's study distances between data points and the mean and see what they tell us. Elena, Jada, and Lin enjoy playing basketball during recess. Lately, they have been practicing free throws. They record the number of baskets they make out of 10 attempts. Here are their data sets for 12 school days. Calculate the mean number of baskets each player made, and compare the means. What do you notice? What do the means tell us in this context? 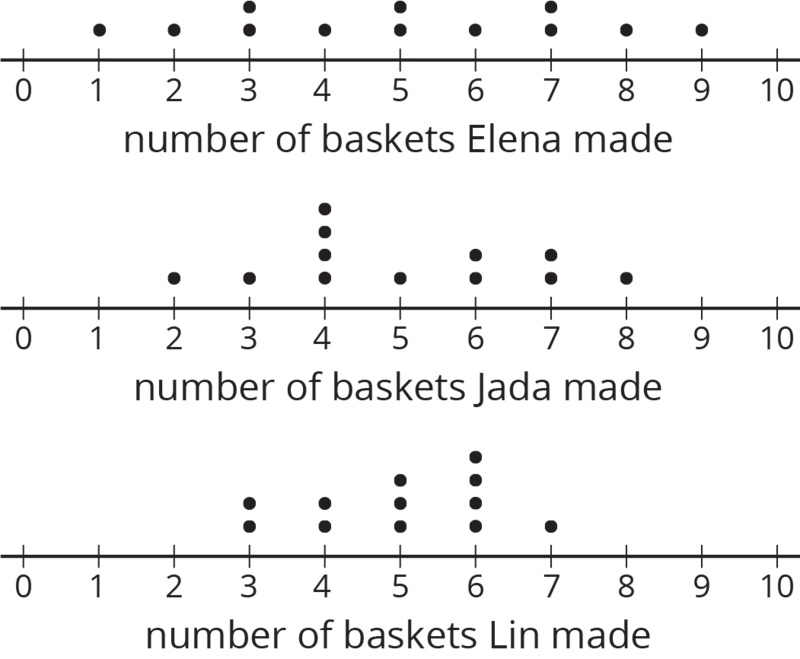 Here are the dot plots showing the number of baskets Elena, Jada, and Lin each made over 12 school days. On each dot plot, mark the location of the mean with a triangle ($\Delta$). Then, contrast the dot plot distributions. Write 2–3 sentences to describe the shape and spread of each distribution. Discuss the following questions with your group. Explain your reasoning. Would you say that all three students play equally well? Would you say that all three students play equally consistently? If you could choose one player to be on your basketball team based on their records, who would you choose? 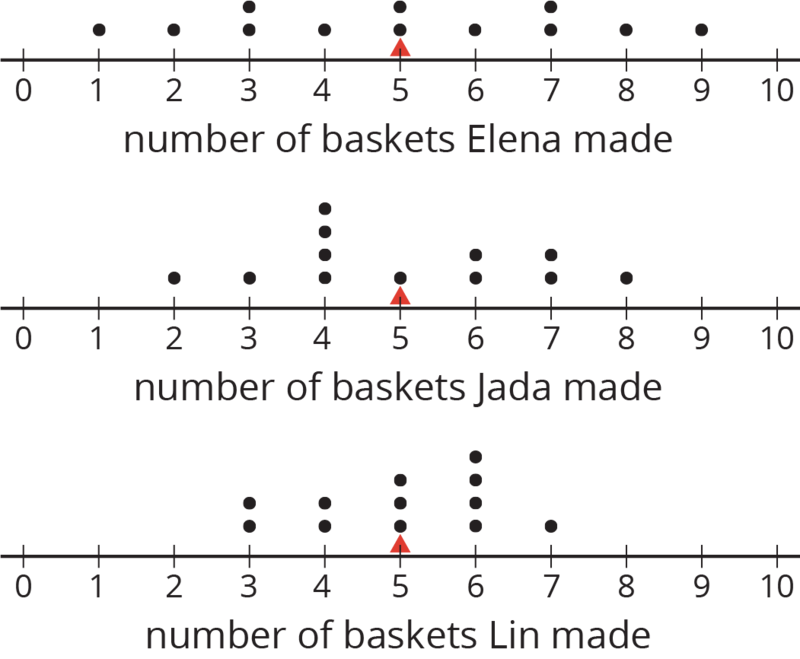 The tables show Elena, Jada, and Lin’s basketball data from an earlier activity. Recall that the mean of Elena’s data, as well as that of Jada and Lin’s data, was 5. Record the distance between each of Elena’s scores and the mean. Now find the average of the distances in the table. Show your reasoning and round your answer to the nearest tenth. This value is the mean absolute deviation (MAD) of Elena’s data. Find the mean absolute deviation of Jada’s data. Round it to the nearest tenth. Find the mean absolute deviation of Lin’s data. Round it to the nearest tenth. Compare the MADs and dot plots of the three students’ data. Do you see a relationship between each student’s MAD and the distribution on her dot plot? Explain your reasoning. Invent another data set that also has a mean of 5 but has an MAD greater than 2. Remember, the values in the data set must be whole numbers from 0 to 10. Your teacher will give your group a deck of cards. Shuffle the cards, and put the deck face down on the playing surface. To keep score: Record each sum and each distance from 22 in the table. After five rounds, calculate the average of the distances. The player with the lowest average distance from 22 wins the game. Whose average distance from 22 is the smallest? Who won the game? We use the mean of a data set as a measure of center of its distribution, but two data sets with the same mean could have very different distributions. This dot plot shows the weights, in grams, of 22 cookies. The mean weight is 21 grams. All the weights are within 3 grams of the mean, and most of them are even closer. These cookies are all fairly close in weight. This dot plot shows the weights, in grams, of a different set of 30 cookies. The mean weight for this set of cookies is also 21 grams, but some cookies are half that weight and others are one-and-a-half times that weight. There is a lot more variability in the weight. There is a number we can use to describe how far away, or how spread out, data points generally are from the mean. This measure of spread is called the mean absolute deviation (MAD). Here the MAD tells us how far cookie weights typically are from 21 grams. To find the MAD, we find the distance between each data value and the mean, and then calculate the mean of those distances. For instance, the point that represents 18 grams is 3 units away from the mean of 21 grams. We can find the distance between each point and the mean of 21 grams and organize the distances into a table, as shown. The values in the first row of the table are the cookie weights for the first set of cookies. Their mean, 21 grams, is the mean of the cookie weights. The values in the second row of the table are the distances between the values in the first row and 21. The mean of these distances is the MAD of the cookie weights. What can we learn from the averages of these distances once they are calculated? In the first set of cookies, the distances are all between 0 and 3. The MAD is 1.2 grams, which tells us that the cookie weights are typically within 1.2 grams of 21 grams. We could say that a typical cookie weighs between 19.8 and 22.2 grams. In the second set of cookies, the distances are all between 0 and 13. The MAD is 5.6 grams, which tells us that the cookie weights are typically within 5.6 grams of 21 grams. We could say a typical cookie weighs between 15.4 and 26.6 grams. The MAD is also called a measure of the variability of the distribution. In these examples, it is easy to see that a higher MAD suggests a distribution that is more spread out, showing more variability.